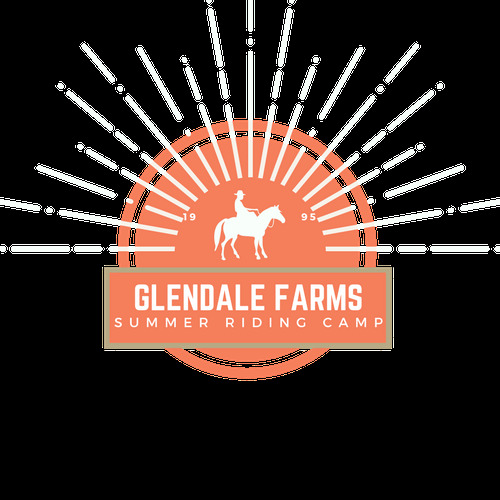 Summer is our favorite season here at Glendale Farms! Hundreds of children have spent their summers with us learning how to ride, groom, tack, feed and care for a horse or pony over the week. The activity filled camp sessions run Monday to Thursday 9am-4pm and Fridays 9am-3pm over the course of the summer. At the beginning of the week our young riders are matched with a horse or pony to care for, ride and bond with. They will ride daily to ensure that our potential equine professionals can gain basic riding skills, or for the advanced rider, new riding skills. We have two outdoor riding arenas and our indoor riding ring that allows riding in all weather conditions. To ensure safety and maximum learning opportunities, riders are divided into groups based on age and riding ability. On Wednesdays riders are taken on an afternoon trail ride to prepare the for the long trail ride on Thursday! The week finishes up with a horse show on Friday where parents, friends and family are encouraged to come and support their young riders. Riders can dress up their horses and ponies and compete in a series of mounted games and events. Spectators are encouraged to cheer on our young riders. Don't forget your lawn chairs! Last year after many requests we added extra activties to our riding program. The children were able to take part in sports activities such as baseball, basketball, hiking, scavenger hunts and various other organized activities. The children really seemed to enjoy these activities and we plan to continue with them this year. We look forward to having you join us this summer!! Camp registration is a great value at $300. Don't delay, register today as slots are limited!